Darkness Sword/Glaive, MC effect has you deal +((MaxHP-CurrentHP)*MaxHP*0.1)% damage, AKA +2.5% when you've lost 25% health, +5% when you've lost 50%, etc. Flavour effect is a clone of Zealot's, you deal +15% damage, but also take +(15/1.4)% damage. Can also click it to swap between Melee/Ranged/Magic forms. No lean of any kind, also no special. I'll see what, if anything, I can do. Having said that, the boards are kind of urgent at this point in time. Do we have info subs for Winds of Change/Time bow and tome? In Media Res: Does Agony's Embrace get +9% damage for having no speical in addition to the +15% damage from the Flavour effect? Ice clone of the Light version. With tweaks due to our standard for a max of +20% Melee damage per source. Ice sword. Click to swap Melee/Magic. No Special, so +9% damage. You're basically paying equal to 15% of one round's worth of HP for +15% Melee damage. This gets /0.75 for the Magic version, since both pay the same HP cost, so Magic version does +20% damage. Both then get +5% from MC. These tweaks have been applied to the Light/Water Bloodblades as well. Set bonus: If you're in Cryomancer Bloodmage, then you do +10% damage. If you're in any other Bloodmage outfit, then you do +5% damage. Are there info for Iron Bloom Maul? We have the info for the weapon set after this (Megathirio) but not this one. Melee Light Sword, 0.1 base lean and neutral BtH lean, no special. Base lean is because units of measurement should always be consistent :V MC effect is that if attacking a Dazed or Sleeping foe, it does +10% damage, could possibly add other stunned statii like Paralyse?. It scales as though it's a Guardian item of the player's level, so the numbers below are for examples. Ranged Light Bow, neutral base/rand and BtH lean. Has a 20% proc true special and a bow special. MC is same as the ruler sword up above, +10% damage vs Dazed or Sleeping foes. Scales same way as well, so numbers below are for example. Any info for this mysteriously arrived Traveller's Blade in the LTS? Well, IMR. Remember how you asked me to provide a list of items that don't have their info subs written in the appropriate submission thread? Here are the weapons among them. See the other appropriate topics for the other items. Also note that there is at least one such item in each of the weapons, armors, shields, spells, pets/guests and miscellaneous items categories. Though, naturally, this list only covers items that I managed to dig up. If you or anyone else remembers of any more items that aren't on this list then feel free to add them or to bring them to the attention of the staff. Also, if any item that has an "alternate version" is mentioned in this list (like the Arctic Athame and the Antarctic Athame, for example) then it is missing both in its regular form and in its alternate form, with the sole exception seemingly being the Dragon Strike Shield. I'm bringing this up because I don't remember off the top of my head if the alternate versions have any different characteristics that actually affect game play or not. Additionally, I would also like to apologize for any items on this list that already had their info subs posted in the appropriate thread buts whose info subs I managed to overlook. It isn't my intention here to create unnecessary work for the staff. Arctic Athame as well as High Noon and Dracolich Devastator plus their variant forms, Fire Draconic Blade as well Fire Dragon Blade and Dragon Strike Lance plus the variant form of the later, Neko's Bow, Wooden Plank, Winds of Time bow, Winds of Change tome, Thunderbird Lance, the yearly boards for this year (Fat Panda Shortboard, ect. 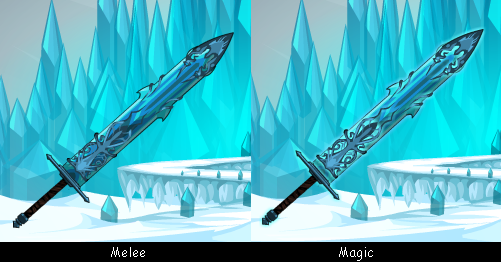 ), Iron Bloom Maul, Crystalline Dagger and King's Song. Description: This blade makes you a bit cold-blooded, and can drain said blood as well. It'll sap your health in exchange for a cool damage boost, which is even greater if you're in a Bloodmage armour! This weapon can swap between Melee and Magic damage. Invito Cervus Snugglificus: Summons Cute Deery as a guest. Invito Cervus Cronenbergio: Summons Scary Deery as a guest. Expelcius: Standard wand attack. If it connects, the monster becomes Choked (-50*[LIGHT]% damage, 1 round). The monster can resist with a save at a +0 bonus (inflict with INT/LUK, resist with DEX/LUK). ImperiOW: Does one hit with -100% damage. If it connects, the monster becomes Controlled (2 rounds, 0.326*[LIGHT] chance of not acting). The monster can resist with a save at a -20 penalty (inflict with INT/LUK, resist with CHA/LUK). Costs the MP listed under "ImpMP" in the table. Is it possible for the Deery guest's ststus to stack with itself and other effects of its kind? Updated stats for the Quindent. It's still in Cap'n Munch's shop. Water spear. Not MC. +2 BTH lean. Special is one hit, Ranged Water, with an additional +3 BTH (for a total of +5). It seems like Expelcius also sometimes procs a daze on the enemy. Is that intended? I believe Big 151 is missing an entry. So, summary of how the stuff works now. Still 10% proc rate, PWD is now a 10% chance of happening (1% total) and is basically considered the MC for the weapon. Guardian Dragon is a 30% chance of happening (3% total) and numbers got tweaked, but IMR worked on that, so I dunno them off the top of my head. The other 4, Mana Vamp, Health Vamp, Spiral Carve, and Awe Blast, each have a 15% rate, or 1.5% chance total for each. It also checks in that order, it rolls first for Mana Vamp, but Mana Vamp's been tweaked. However, you also will not even get Mana Vamp unless you're missing enough MP to benefit. So if you're full on MP, you never get Mana Vamp. It checks for (PlayerMaxMP - PlayerMP), if that # is not >= the MP cost of a spell equal to your level, Mana Vamp doesn't proc. Health Vamp just checks if you're <= 75% HP, otherwise it won't proc. Spiral Carve is now auto-hit, but deals *0.85 damage. Awe Blast is a standard special. If either of the Vamps get removed from the pool, their proc rates get divvied up equally between Spiral/Blast. So if you're full on HP/MP, your proc rates are 10% PWD, 30% GD, and then 30% each for Spiral Carve or Awe Blast. this is to a minimum of 1 expected Melee attack. numPlayerStat = (200 + 13.2*PowLvl)/200 * (intExpectedSTR/8 + intExpectedLUK*3/80); <-- Changed! Thanks to Afterlifex for posting all this in General! Everyone loved the Awe weapon update, right? Well I've been working on some extra things that didn't make it the original weeks. I just finished adding a new Special, Soul Vampire. It does exactly what you think it does. I'm actually adding it as a bugfix, because I accidentally rolled some code with Werepyre, and I needed to fix it ASAP. Hooray? This is a special that deals damage to the opponent and heals your SP. No information was given in the proc rate or anything like it. Sorry, I just discovered that this is partially wrong. The Pearl Dragon Blade seems to give a stronger status if you're using the melee version. The choke can reduce the monster's effectiveness to 79.53% with the magic version against 130% resists, while it gives 72.7% with the melee version. So... It seems the magic version has 33% less status inflicting power than the melee one, which isn't listed in the pedia entry at all. Testing against the Combat Practice (which is not an energy monster, so the choke has 1/2 effectiveness) gave a 89.5% choke with melee version and 92.13% with the magic one, so this seems consistent. Uhn... Found a few weird things in the Encyclopedia that were related to the Akriloth's Carnage Sword. First, in the index by element, the level 150 version isn't listed for some reason. Second, the links to the versions of level 90, 110 and 130 link to the Giant's Cotton Swab instead of linking to the weapon in question. Third, the weapon isn't tagged as released in the subs. Fourth, in the analysis section, the special is listed as having the damage of a 20% proc special (1488% BR and 1665% LS), but the subs show completely different numbers (19.84% BR and 22.2% LS) as it's a 10% proc special. I think those were all? The same issues seemed to repeat with the staff, except the thing of being wrongly linked in the pedia that is. 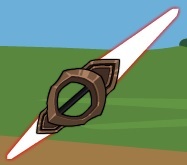 Melee/Ranged/Magic Fire Scythe, click the handle to change Melee/Ranged/Magic damage, and click the blade of the scythe to equip the Rastille armour. 1/3 base lean and -3 BtH lean, weapon costs *1.65 of a normal weapon. Light version of Soul Drinker, MC is +1/6 damage on the special, flavour effect is the special checks your HP and MP on firing, if either is below 80%, the special deals half damage and heals you based on damage done. HP healing takes priority over MP healing, healing is = to DamageDone/MobLightRes for HP, with a *1.5 multiplier for MP healing. This special Chronomancer's dagger is powered by a flame frozen in time. It can strike at your foe's body or soul, damaging their health or spirit respectively! *******Click the blade to swap weapon types! *******Your weapon now deals «» Melee damage to your foe's HP! *******Your weapon now deals «» Ranged damage to your foe's HP! *******Your weapon now deals «» Magic damage to your foe's HP! *******Your weapon now deals «» Melee damage to your foe's SP! *******Your weapon now deals «» Ranged damage to your foe's SP! *******Your weapon now deals «» Magic damage to your foe's SP! ******†Click the hilt to attack your foe's body! *****††Your dagger will now strike at your foe's body and damage their HP! ******‡Click the hilt to attack your foe's soul! *****‡‡Your dagger will now strike at your foe's soul and damage their SP!